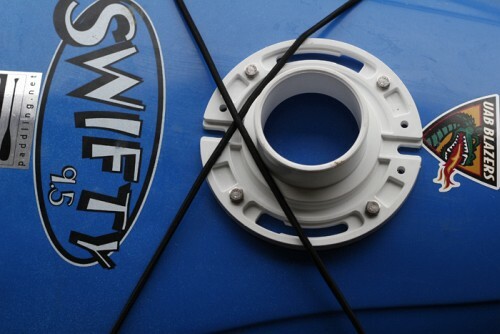 Another more frugal way is to use a toilet flange as photographer and kayak paddler Jeremy Richter explains in the post below. I recently installed a homemade camera mount in my kayak simply by running a bolt through the foredeck and threading a Slik SBH-100DQ ballhead onto the bolt. That set-up was much improved over the pedestrian methods we were using to film while paddling before that, and provided some decent video on a fishing trip. 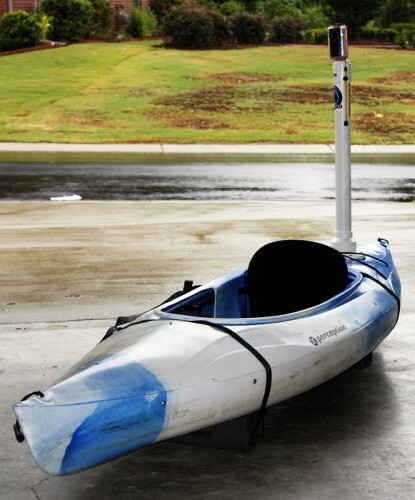 So after that moderate success, I was determined to create an elevated mount that would provide not only a better perspective (one that more closely resembled what the paddler was seeing at eye-level), but also one that could include the paddler in the video. Installing the flange on the aft deck of the kayak was really the hardest part. After determining the best placement of the flange, and marking where the holes would go [remember the old proverb: measure twice, drill/cut once], I then had to get up the courage to drill four holes in my boat. Upon drilling the holes, I re-placed the flange and ran the bolts through the holes, installing the washers and nuts within the hull. 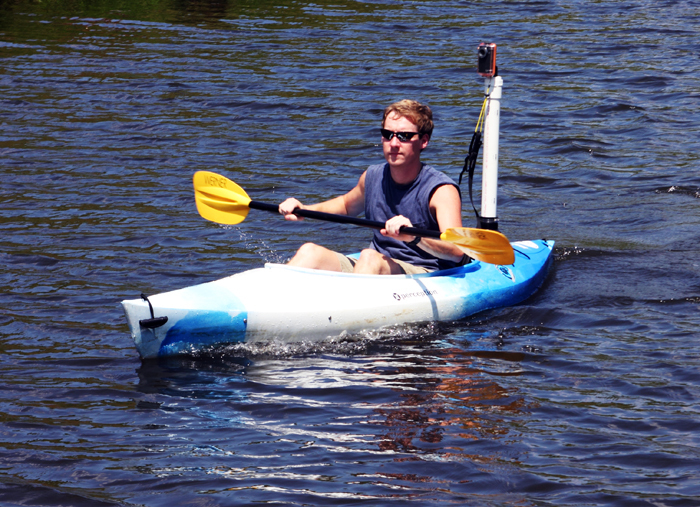 This is how the 3″ flunge attaches to the kayak. Piecing together the rest was done easily enough, from bottom to top: flange + reducing coupler + 2ft-pipe + coupler + plug. I then drilled a hole through the plug/cap and installed the 1/4″ bolt (1″ long) through that hole, to which the ballhead attaches. 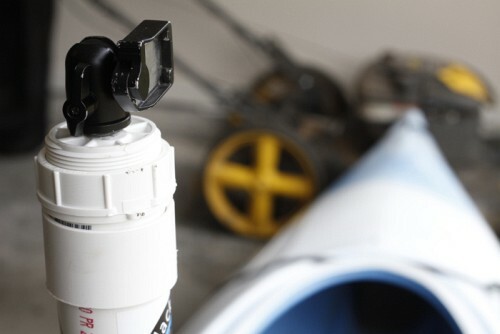 You may need another nut or washer between the cap and tripod head to make sure it gets snug before rounding out. After getting everything pieced and fastened together, it was time test this newest fabrication. A friend and I carried the kayak down to a local pond for a trial run. Mostly we were interested to know which would be better the rubber reducing coupler or the PVC version. 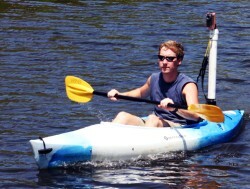 As you may have noticed, the rubber mount allowed for a little more sway while paddling. Pros: Any impact that mount or camera must absorb upon flipping will be reduced because of the give. Cons: Experiencing some vertigo and nausea while watching videos. An important note to add here is that I tethered the camera to the boat so that in the unfortunate event that disaster struck, the camera would likely be salvaged. To my disappointment, the focal length of my Flip Video camera is roughly the equivalent of 35mm in film formats, which isn’t very wide. 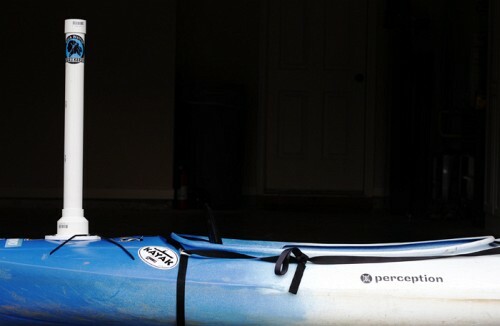 Presently, it allows only glimpses of the paddle, and nothing of the boat or paddler. The easiest solution to this is to used a camera with a wider focal length. I have a Panasonic LX3 with good video capabilities, but currently, the water resistant housing I built for it has fallen into disrepair.